Brazen Beau’s success on the track continues to be replicated in the saleroom as the latest chapter in his remarkable story unfolds. The Champion sprinter has become a remarkable sire with 26 Australian-bred yearlings (some of whom fetched six-figure amounts when offered as weanlings) likely to create a buzz at the Magic Millions Gold Coast sale in January 2018. 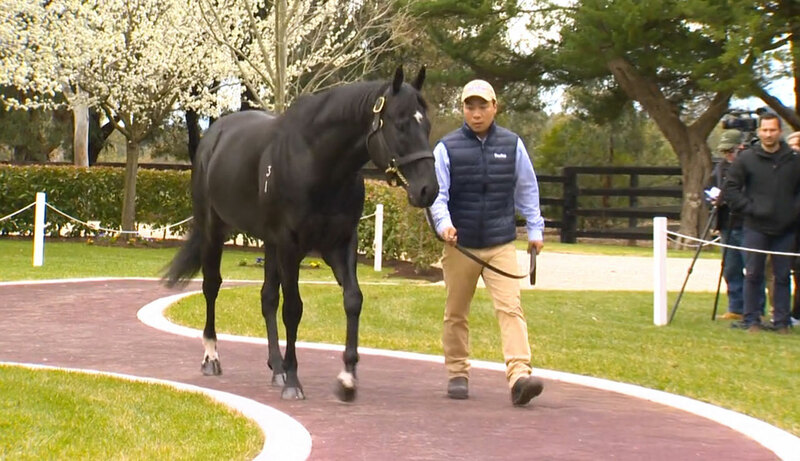 This excitement around Brazen Beau first emerged at the Magic Millions National Broodmare Sale in June 2016 where he led the first-season sires' table as eight mares in foal to the champion sprinter sold for an average of $253,750 and a top price of $570,000. The Champion Australian sprinter of his generation was bred by former jockey Bernie Howlett, who has the rare distinction of having ridden, trained and bred a G1 winner. Howlett offered the son of I Am Invincible at the 2013 Inglis Classic Sale where he was knocked down to syndicator Grant Morgan for $70,000. Everything Morgan saw in Brazen Beau came to fruition as he made his debut at Canterbury in February 2014 with a four-and-a-half-length victory. Within three months the colt had won at G2 level and a month later placed in the G1 J.J. Atkins Stakes in Brisbane. Then he finished fifth in the G2 Danehill Stakes at Flemington before returning to Sydney to win the G2 Roman Consul Stakes. That November trainer Chris Waller brought a fitter and stronger colt back to Melbourne and Brazen Beau duly won the G1 Coolmore Stud Stakes confirming his special status. “This horse is the complete package. Just look at him: he’s strong, well-balanced. He’s the perfect horse,’’ Waller said after that victory. That victory led to Darley’s purchase of Brazen Beau, who next finished second in the G1 Lightning Stakes before achieving the rare feat of winning the G1 Newmarket Handicap as a three-year-old. Waller described that victory over a field including two of the world’s highest-ranked sprinters as “one of the most dominant in this race for decades”. “Obviously he’s beaten a world-class field and he’s beaten them with a bit of contempt really,” he said. Brazen Beau concluded his racing career in England with the highlight an unlucky second place in the 2015 G1 Diamond Jubilee Stakes at Royal Ascot. He joined the Darley stallions roster in Australia in 2015 and in Britain in 2016. Lot 73, a colt from the Exceed And Excel mare Medici Madonna, an unraced half-sister to multiple G1 winner Divine Madonna and the Listed winner Maternal. Lot 267, a filly out of Sainted and from the family of the G1 winning filly Bonanova and her brothers, Fraternity and Telesto, and of the outstanding producer, Eight Carat. Lot 372, a filly out of Tahnee Tango, a winning three-quarter sister to the outstanding racehorse Shogun Lodge and from the family of the G1 winners Referral, Singing The Blues and Lashed. Lot 758, a filly from Gig, a winning half-sister to the G1 Epsom Handicap winner Happy Clapper. Lot 353, a half-sister champion NZ 2YO Ruud Awakening and four other winners from the Danehill mare Dawn Almighty. Lot 584, a filly from the Fastnet Rock mare Plastic Fantastic and from the family of three-time US G1 winner and NZ champion filly Happyanunoit. For a full list of Brazen Beau's yearlings at the Magic Millions, please click here.